Cy the Cardinal is the mascot of Iowa State University's sports teams. 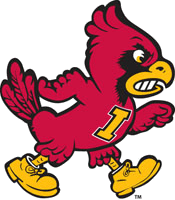 Since a cyclone was difficult to depict in costume, a cardinal was selected from the cardinal and gold of the official school colors. A cardinal-like bird was introduced at the 1954 homecoming pep rally. A contest was conducted to select a name for the mascot, and the winning entry of Cy was submitted by 17 people. The first to submit the name, Mrs. Ed Ohlsen, won a cardinal and gold stadium blanket. Cy has won two national mascot challenges since 2007; the CBS Sportsline Most Dominant College Mascot on Earth in 2007, and the CapitalOne Bowl National Mascot of the Year in 2008. ↑ "Origin of Cy". Cyclones.com. 11 August 2006. Retrieved 4 August 2011. ↑ "About Cyclone athletics". Iowa State University Relations. Retrieved 4 August 2011. ↑ "Cy Wins National Mascot Challenge". Cyclones.com. 1 January 2009. Retrieved 4 August 2011. This article is issued from Wikipedia - version of the 8/15/2014. The text is available under the Creative Commons Attribution/Share Alike but additional terms may apply for the media files.